The Centers for Disease Control and Prevention (CDC) released improved procedures for donning (putting on) and doffing (taking off) personal protective equipment (PPE) for healthcare workers caring for a patient with suspected or confirmed Ebola Virus Disease (EVD). They have also released some pretty comprehensive video training to show the donning and doffing procedures. Image #1: PAPR, image courtesy of the CDC (www.cdc.gov). Image #2: N95 Respirator, image courtesy of the CDC (www.cdc.gov). Powered Air Purifying Respirator (PAPR): A PAPR with a full face shield, helmet, or headpiece. Any reusable helmet or headpiece must be covered with a single-use (disposable) hood that extends to the shoulders and fully covers the neck and is compatible with the selected PAPR. See Image #1. N95 Respirator: Single-use (disposable) N95 respirator in combination with single-use (disposable) surgical hood extending to shoulders and single-use (disposable) full face shield. See Image #2. 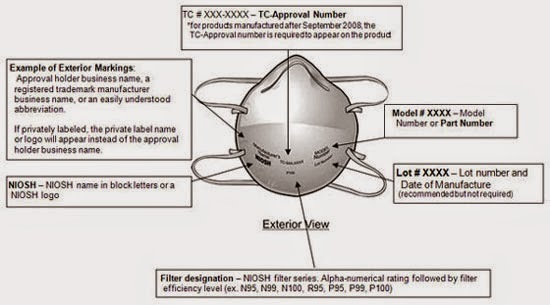 The CDC reminds hospitals that: "If a NIOSH-certified PAPR and a NIOSH-certified fit-tested disposable N95 respirator is used in facility protocols, [the hospital must] ensure compliance with all elements of the OSHA Respiratory Protection Standard, 29 CFR 1910.134, including fit testing, medical evaluation, and training of the healthcare worker." Since flu season is already upon us, and many hospitals have already started their annual fit testing requirement for use of N95 respirators, this should not be an increased burden on the hospital. I watched some of the CDC/Johns Hopkins Medicine videos for EVD PPE donning and doffing and quickly realized that many healthcare workers would start to "zone out" during this web-based video training. This lack of attention during training will be a challenge for hospital administrators, since most hospitals do not have the resources (time or personnel) available to do repeated hands-on training activities. 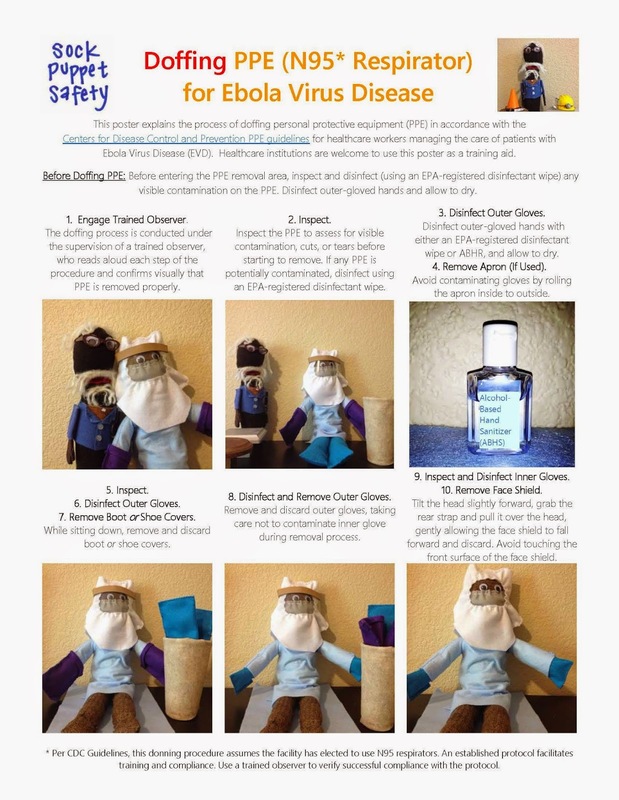 The CDC used to have a poster of the steps for donning and doffing PPE, but it has not been re-released since the new, more comprehensive guidelines were published on October 20, 2014. So I decided to make my own PPE posters starring my team at Sock Puppet Safety (more info on that new project later). 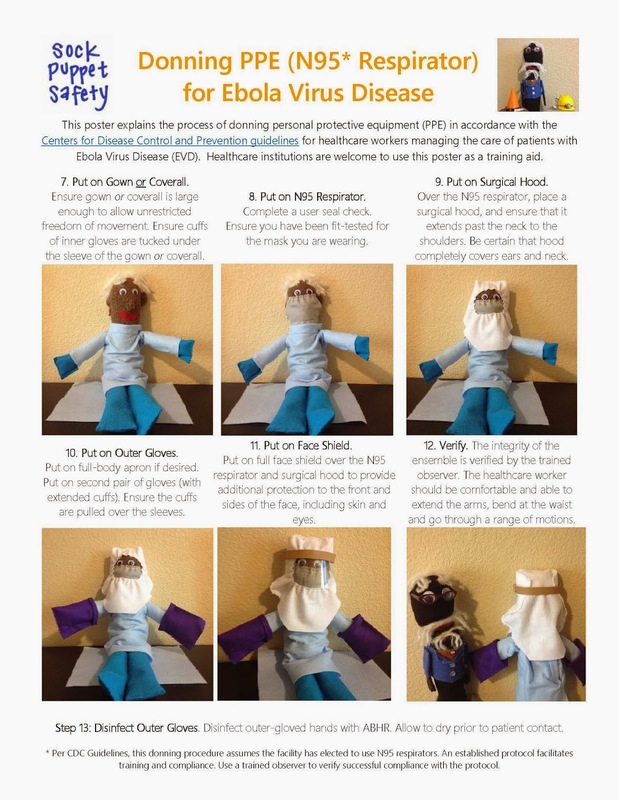 These posters were designed using the October 2014 CDC guidelines, with a handmade puppet with removable PPE. That's one of the other challenges that hospitals are facing - how to train healthcare workers in donning and doffing without using up all their supplies. Many manufacturers have the CDC required PPE on backorder and many hospitals only have enough to last a few days to care for one patient. 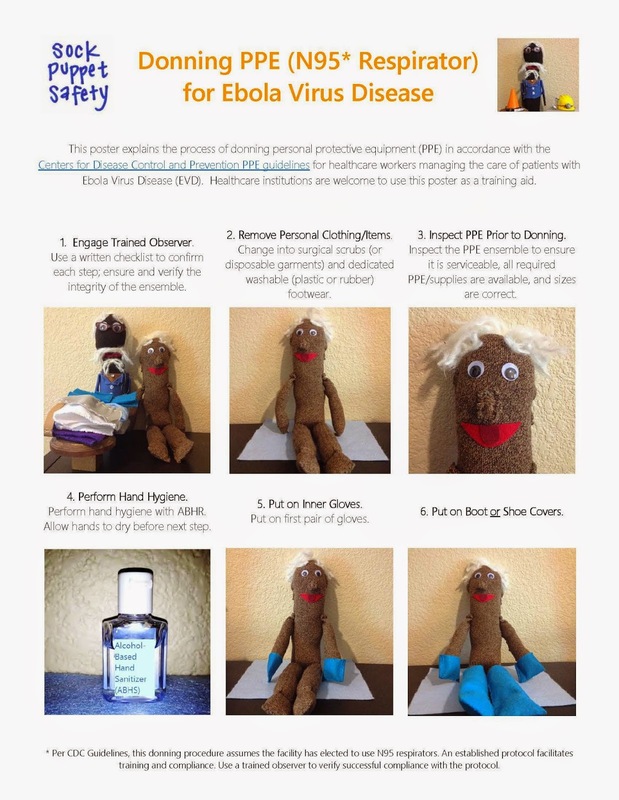 This Infectious Disease PPE Training Poster is brought to you by Sock Puppet Safety - starring Dr. Plurdistein (trained observer) and Peter (shown in proper PPE). Here's the front side of the DONNING poster. Donning PPE (N95 Respirator option) for Ebola Virus Disease, front side. Here's the back side of the DONNING poster. Donning PPE (N95 Respirator option) for Ebola Virus Disease, back side. Here's the front side of the DOFFING poster. 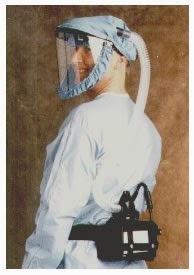 Doffing PPE (N95 Respirator option) for Ebola Virus Disease, front side. And, finally, here's the back side of the DOFFING poster. Doffing PPE (N95 Respirator option) for Ebola Virus Disease, back side. The donning and doffing protocols are particularly important to reduce the risk of infection of the healthcare worker providing care to the suspected or confirmed EVD patient. The waste associated with the EVD patient must be carefully controlled and the donning and doffing procedures are important to reduce the risk of transmission via direct contact with blood and bodily fluids. The picture above shows EVD as the blue microbes in the mock DOT Category A waste container - these blue microbes are actually Penicillium (Giant Microbes) since they're all I had on hand at the time, but you get the idea. 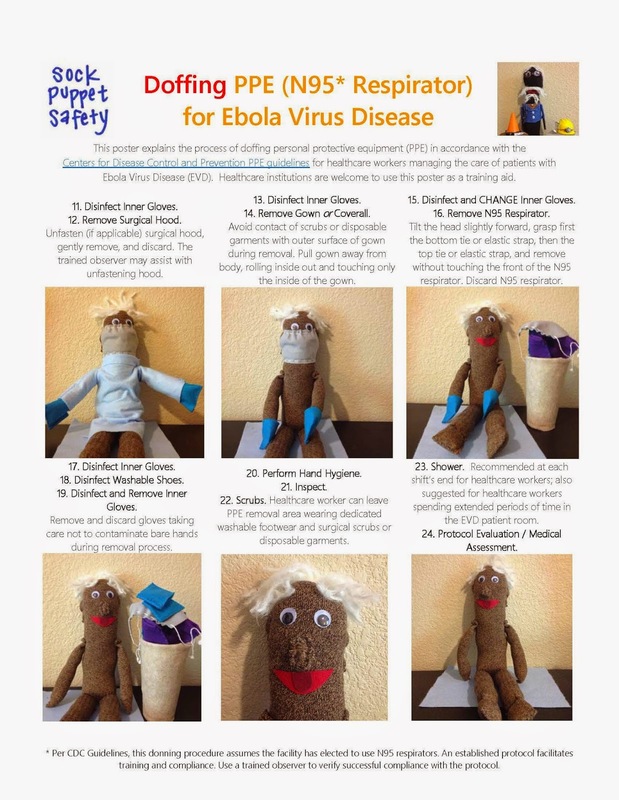 The Ebola Giant Microbe was sold out and won't ship until 12-10-2014. When a healthcare worker leaves an EVD patient room, they are likely to be covered in Ebola virus from splashes of blood and bodily fluids. If the donning and doffing procedures are carefully followed, the EVD potential exposure is significantly reduced. If donning and doffing procedures are not carefully followed, unintentional exposure can happen. In the case of EVD, sharing is NOT caring. And yes, those are static-reducing laundry balls that have been broken in half by my overeager Alaskan Malamute. The laundry balls make great fake microbes. If, for some weird reason, you like the posters and want to use them for training or entertainment purposes, send me an email and I'll be happy to share them. The posters are higher resolution than the images in this blog post. Happy start to the holiday season from The Industrious Hygienist and her team at Sock Puppet Safety! Meet the team at Sock Puppet Safety - you'll be seeing more of them in the next few months.